Hello...again Everyone :) this is my second post of the day. If you are looking for the Reverse Confetti September Color Challenge please click HERE. Be My Guest, Starry Night, and past released Loved stamped sets, perfect for the coming holiday. 1. 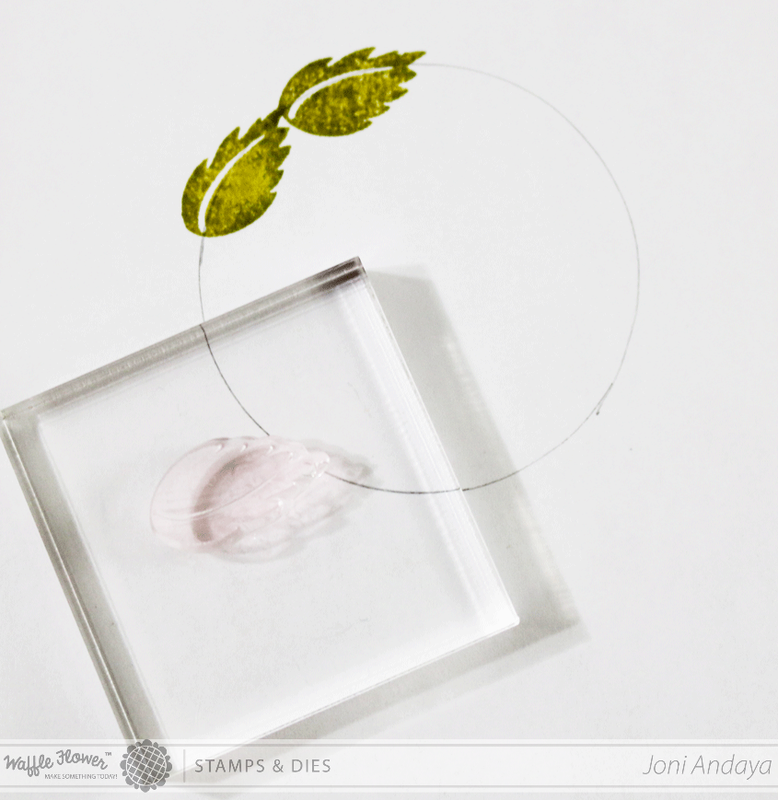 To start, I first drew a circle on white cardstock, then stamp the leaf from Loved stamp set to create a wreath using the rock and roll technique, a sample video HERE. 2. 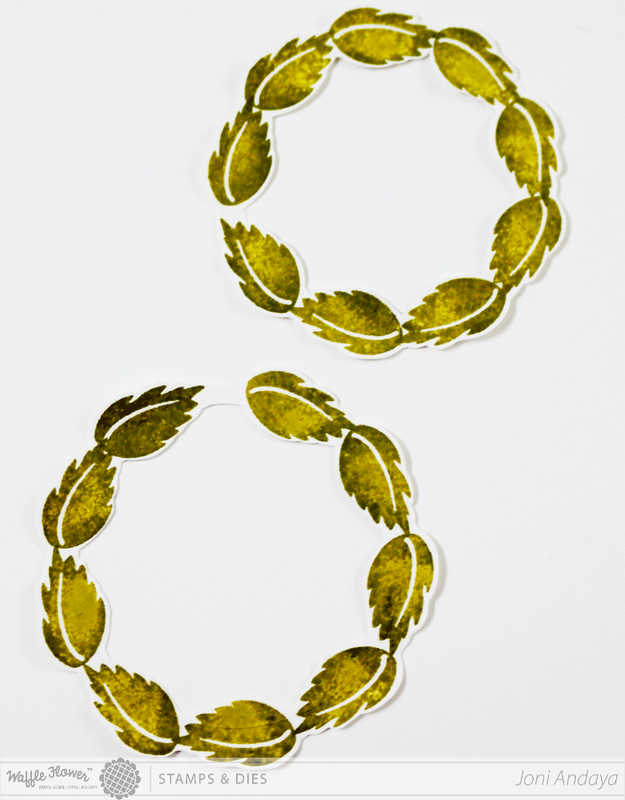 Once the wreaths are done, then I cut the shape I created inside and out. 3. I then adhered them together and put it away for the mean time. 4. Next, I cut a panel smaller than the A2 card base I created. 5. Then I stamped the circle image from Starry Night stamp set to create a window for my card. 6. Once window for the panel is done, I then drew a pencil mark using the window panel I created. 7. 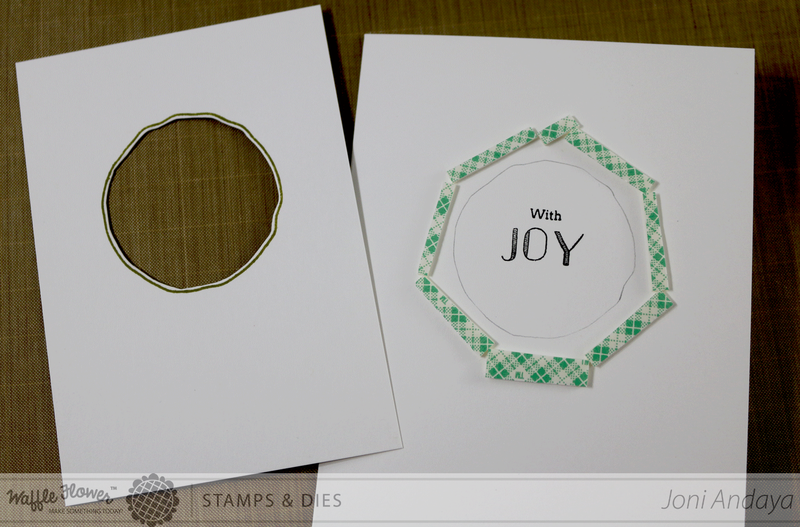 This will serve as a guide where to adhere the foam tape and stamped the sentiment from Be My Guest (Joy) and Loved (with) stamp sets. 8. Once I finished drawing my guide, I then adhere the clear cardstock behind the window panel. 9. I then fill in the center of the card base with Pretty Pink Posh sequins in Gold, Sparkling Clear in all 3 sizes, Lemon Meringue, and Marshmallow. 10. Next, I adhere the panel on the card base. 11. Then adhere the wreath with foam tape on top of the window panel I created. 12. Next, I gold embossed the ribbon from Loved stamped set on vellum and die-cut the ribbon image using the coordinating die from Loved stamp set. Lovely card.Love the wreath and the pretty bow. your shaker cards are always a delight..
What a great wreath shaker card. Love it! Super cute CAS shaker card! I love the way you made the wreath! GORGEOUS card and thank You so much for sharing the step by step! Absolutely love your card! I am a huge fan of white card bases with lots of white space. A wreath shaker ... I just love that!! So clean and crisp, even with the shading on the leaves. Gorgeous! Thanks for the detailed how-tos too! Beautiful shaker card,Joni! Love how the leaves turned out!! So creative & fabulous, Joni! What a beautiful shaker card! Love this wreath!